A perfect mix of nature and nightlife, charter a yacht in Marmaris for an unforgettable experience on the Turkish Riviera. A long, golden coastline that stretches for miles, numerous isolated bays and inlets, ancient cities, and myriad marinas, Marmaris has all the ingredients for a picture-perfect yacht charter holiday on the Turquoise Coast. Nestled among rolling hills at the junction of the Aegean and Mediterranean seas, Marmaris is sure to liven up your Turkish yacht charter adventure. This bustling resort town is where the yachting beaux monde come to play. Drop anchor in the inviting harbour overlooked by a castle, and indulge in all that Marmaris has to offer. 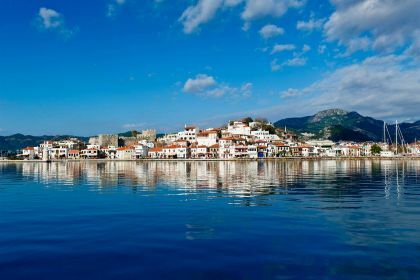 Marmaris has always been an important coastal town and trade centre for centuries, due to its location on the intersection point of Aegean and Mediterranean Seas. Now the city is famous for its beautiful beaches and great diving sites. For a change of scenery than that enjoyed on the deck of your private yacht, there are scenic walking trails in the Atatürk Park. For a touch of history, you can visit the Marmaris Castle, located in the old town. It’s currently a museum, chock-full of rare, well-preserved artefacts, and events and exhibitions are hosted on a regular basis. 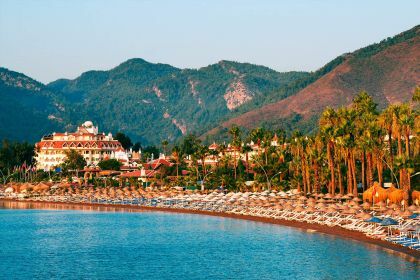 Icmeler is a beautiful beach resort only 8 kilometres Marmaris. Discover private beaches where you can laze on sunbeds and swim in the crystal-clear water against the backdrop of magnificent mountains. It’s also particularly well-suited for children due to its soft, gently sloping sand. For a beach slightly more off the beaten track, try Cleopatra Beach on Sedir Island or Kumlubuk Beach. Step off your luxury yacht for a night of fine dining in Marmaris. The area around the Netsel Marina is known for a calm setting and many luxury dining options. Pineapple Restaurant is one such place, with an elegant atmosphere and a view of the marina. You can also dine at one of the several luxury hotels in the area. The five-star D-Resort Grand Azur offers both the Steak & Bar Restaurant as well as the Palmiye Restaurant. There’s also a beach bar where you can enjoy a nightcap before heading back to your private yacht for the night. The nightlife in Marmaris is vibrant and there are plenty of bars, discos and nightclubs to choose from. A chic option is Hix, a premier bar located in the yacht-lined marina. Bar Street, near to the marina, is a party-goers paradise come nightfall, teeming with bars and clubs. For a slightly calmer atmosphere, enjoy a cocktail in the Uzunyali (Long Beach) area, or relax at the Beach Bar at D-Resort Grand Azur. There’s plenty for kids to enjoy on a yacht charter vacation in Marmaris. 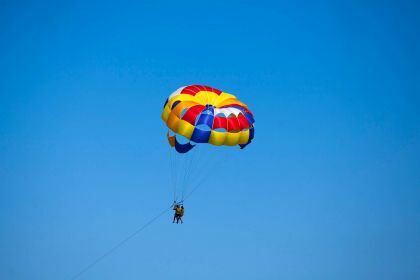 There are several excellent beaches that are suitable for kids, and many water sports available as well. Kids might enjoy exploring the remote coves and beaches along the Datca (Datça) Peninsula, and an al fresco meal or barbeque on a private beach is a perfect way to end a busy day of swimming and snorkelling. Marmaris has several water parks as well, such as the Atlantis Waterpark. Many hotels have a plethora of kids’ activities and entertainment on offer. 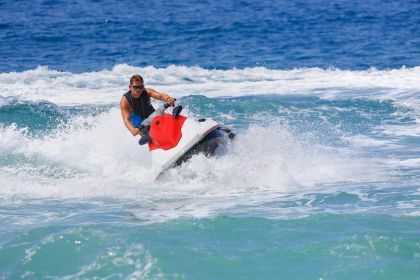 And of course, if your children enjoy water sports your large yacht can be stocked with canoes or kayaks and all the equipment necessary for enjoying a pampered adventure at sea. 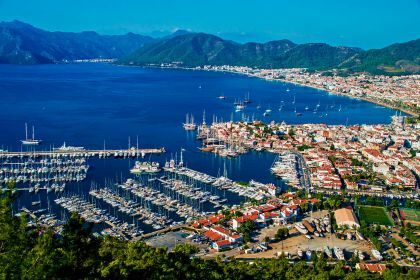 Summers in Marmaris can be rather hot, so planning your yacht charter for just before or just after the season means you can enjoy plenty of glorious sunshine while dodging the crowds and the sweltering heat of mid-summer. Our charter broker is at hand, willing and ready to help you plan your perfect yacht charter vacation along the Turkish Riviera. From the exciting buzz of Marmaris to the seclusion and stillness of Gocek, we’ll help you plan an itinerary that allows you and your family to soak up all that this unrivalled part of the world has to offer. Charter a luxury motor yacht, catamaran or sailboat for a yachting vacation that will stay in your memory for years to come. Drop us a line here or give us a call for an unrivalled sailing experience in Marmaris.